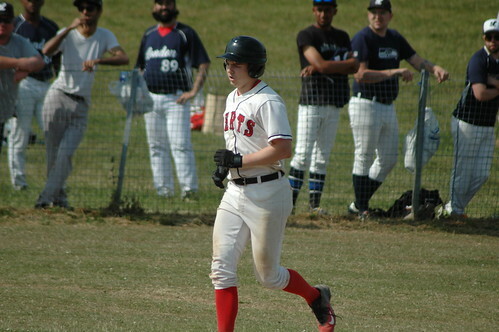 The Herts Falcons claimed a big scalp in the National Baseball League (NBL) with a stunning victory over the powerful London Mets at home at Grovehill (on Sunday 1st July). It was another perfect sunny day for baseball, and the team got into a groove quickly. Zack Longboy pitched a gem, backed by a home run from GB catcher Conner Brown, to give the home side a narrow 10-9 lead entering the final inning. Far from crumbling under pressure, the Falcons piled on. Both Phil Clark and Will Zucker — fresh from claiming a national baseball title with his university side — drove in runs. The coup de grace was a grand slam homer from manager Cris Hiche. That sealed the deal and ended the game to give Herts a 21-11 win. Game 2 of the double header saw London take revenge. Zucker started on the mound, but the Mets scored 11 in the first inning on their way to a 20-1 win. Herts’ only hits both came from NBL rookie Tom Carson. 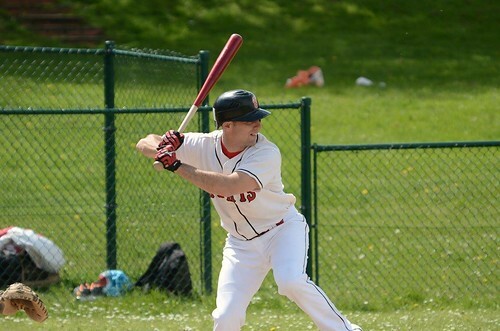 Over on Grovehill’s other diamond, the Herts Hawks went down 10-2 in the first half of their double-header at home to Sidewinders in the Double-A league. One big inning undid the Hawks, and despite excellent relief pitching from Aaron Witter the bats could not make a dent on the visitors’ lead. Herts also fell behind early in Game 2. But this time they rallied back dramatically. There were hits from Hunter Devine, and Gilberto Medina. The Hawks’ manager Michael Cresswell put an exclamation mark on the comeback by hitting his first ever home run in the top of the seventh. It capped an 11-9 win. In the Single-A league, the Herts Raptors stayed close to the pace-setting London Musketeers for 2 innings. Smart pitching from Paul Auchterlounie and a double play turned by second baseman James Emblow helped. But the visitors’ bats came alive in the third, and tacked on in the fourth. As a hot day at Grovehill drew towards an end, London had the game by the scruff of the neck. Another strong relief appearance by Giuseppe Basilea slowed the scoring, and Simon Radford – returning from injury — got his debut hit for Herts. But it wasn’t enough to prevent a 24-5 defeat for the Raptors. They travel to Richmond this weekend, looking to get back to winning ways. New youth players (4 to 17) and adult players (14 and over) can join at any point during the year. The club welcomes boys and girls, men and women, from complete beginners to elite players. Click here for more details or contact us.